Well, it certainly feels like I say this every year, but the controversy that the BCS faces now after Oklahoma absolutely thrashed the Texas Tech Red Raiders is without precedent. All indications point to a three way tie in the Big 12 South that seems impossible to break, so this problem will of course be solved by none other than the pollsters and the computers. Most agree that in the event of the three-way tie, Texas Tech is out of luck by virtue of such a devastating loss and an uninspired defensive performance that failed to force a punt the entire game. And as far as that goes, suffice to say, wow. Uh huh. Yes, that actually makes boatloads of sense to me. The obvious point of the statement is that since all three teams lost to each other once, there is no order you can put them in that doesn’t have one team ahead of a team that they lost to. Following? Given that logic, you can only use head to head competition as a factor in this debate insofar as it relates to the overall body of work. Keeping in mind we’re assuming an Oklahoma win over Oklahoma State for this scenario, which is certainly not a done deal. Edge: Probably Texas at this point by virtue of having played that game against Missouri and winning impressively. And, their biggest win, over the Sooners on a neutral field, seems better than Oklahoma’s biggest win, which has to be the slaughter at home on Saturday. Still, OU has an argument here, as wins over TCU and Cincinnati look better every day, but they played two Division 1AA schools in the preseason and also beat winless Washington, while Texas has not played anyone but Division 1A. Texas: They lost a nail-biter in a difficult environment on the road against Texas Tech that could have gone either way. Oklahoma: They lost a high-scoring battle on a neutral field. Edge: Texas, most definitely, even overlooking the head-to-head factor. So, unless Oklahoma really puts a hurting on Oklahoma State next weekend, I think Texas has a strong argument that they’ve had the better body of work over the course of this season. However, if the Sooners win by another impressive margin (this time on the road at night), then that would certainly change things, considering what a tough time Texas had with Oklahoma State at home. A big win on the road would mean that Oklahoma manhandled teams in their last two games that Texas struggled mightily with, and that might be enough for me (and the more important decision-makers) to vault Oklahoma past Texas. Stay tuned. Of course, there is an even crazier scenario: Oklahoma State beats Oklahoma, setting up a two-way tie at the top of the Big 12 South, which then is won by Texas Tech, because when only two teams are tied at the top, head-to-head is the first tiebreaker. This is when things really get interesting. If Texas Tech beats Missouri in the Big 12 Championship, is it possible that they would fail to pass Texas in the BCS Standings? The way it sets up currently this looks like a strong possibility. How can anyone possibly justify putting Texas in the championship over Texas Tech in this scenario? That would be utter madness, the likes of which the always controversial BCS has never seen. I for one certainly hope it doesn’t come to that, and actually don’t think a team should ever have a claim to play in the championship if it doesn’t win its own conference–Oklahoma proved my point a few years back. The forgotten team in all of this has to be USC. Their only loss, at Oregon State on a Thursday night, is looking better every day. They’ve suffered from a weaker Pac-10 this season, but do still have that dominating win over Ohio State. Home wins over Oregon and California appear to be the next best on the resume, and games against UCLA and Notre Dame don’t really give the Trojans much hope to vault over anyone in the Big 12. However, they’re still two spots ahead of Texas Tech in the BCS, and it isn’t inconceivable that they could hold ground even if the Red Raiders when the Big 12, or even more so, if they lose to Missouri. The most difficult obstacle in that scenario appears to be leapfrogging Texas, who might actually benefit from not playing in the conference championship if the Big 12 South representative loses to Missouri, which is not a far fetched scenario in the least. – If Oklahoma beats Oklahoma State by more than 20 points, expect to see the Sooners in the Big 12 Championship playing for a national championship spot. If they lose to Missouri, it appears Texas will get the bid, but USC has to be in the conversation. – If Oklahoma beats Oklahoma State by less than 20 points, expect to see Texas in the Big 12 Championship playing for a national championship spot. If they lose, it gets trickier, but basically comes down to Oklahoma and USC. – If Oklahoma State beats Oklahoma, all bets are off. Texas Tech wins the Big 12 South without controversy, but could win the conference and still not pass Texas in the BCS standings. In the event that they lose, Texas looks to be in the best position, but USC certainly has an argument, since neither Texas or Oklahoma would have won their conference. #11 Georgia at #22 Georgia Tech, 11:00 CST, CBS: Not too many people would have expected this to be as good a matchup as it is when the season began, but while the Bulldogs have underachieved, the Yellow Jackets have been a big surprise. Auburn at #1 Alabama, 2:30 PM CST, CBS: This looks like a no-brainer, but it’s still the Iron Bowl, and Alabama hasn’t had much luck recently in this one. Nothing better could happen to salvage Auburn’s disappointing season than an upset win here. #2 Florida at #23 Florida State, TBA: This is a major trap game for the Gators, who’d be well advised not to look past an improving Seminole team. Florida has been a different team since losing at home to Ole Miss, and should be fine here, but if the Rebels can beat them on the road, you’d better believe the Noles could beat them at home. #4 Oklahoma at #12 Oklahoma State, TBA, ABC: See above, the outcome of this game determines the landscape of the national championship picture. I expect Oklahoma to have a lot more trouble here than they did Saturday night. #18 Oregon at #17 Oregon State, 6:00 CST, ESPN: It’s simple, if the Beavers can win this installment of the Civil War at home, they’re headed to Pasadena. You have to be without a soul not to be pulling for Oregon State in this one. Plus, the Beaver mascot is adorable. 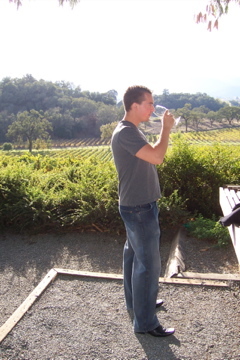 Napa and Sonoma Tasting Recap…Again. In case you missed it, my wife and I completely lost our minds and took a second trip of the year out to wine country only a week after returning from Mexico. After visiting another 20 wineries (most of them new) and sampling over 100 different wines, here is a brief recap of my favorite wines I tasted for each of many varietals and styles. GOLD: Girard Cabernet Sauvignon Napa Valley Estate 2005, 93 Points, $75- Juicy blackberry and black cherry aromas, all dark fruit with a hint of chocolate. Elegant and structured, bursting with blackberry, black cherry, blueberry and eucalyptus, undertones of powdery chocolate. Mouth-coating tannins add complexity, this is a monster, with a finish that lingers for minutes. A colossal amount of dark fruit here with a long, cedary, spicy finish. SILVER: Pride Cabernet Sauvignon Napa-Sonoma Counties 2006, 92 Points, $65- Dark raspberry, black cherry and vanilla on the nose. Soft-bodied cherry, raspberry and red currant fruit body, creamy and smooth, with cedar, cigar box and vanilla bean through the long, complex finish. Lush throughout with a chocolate-covered cherry nuance. Tobacco spice lingers, complex and delicious, incredibly smooth finish for such a young wine. BRONZE: St. Clement Star Vineyard Cabernet Napa Valley 2004, 92 Points, $80- Juicy black cherry, cedar and a hint of oak on the nose. Soft-bodied but full of black cherry, dark raspberry, cedar and mint, subtle vanilla bean. Long finish of cedary spice and fruit, cola notes. Deep and intense, round tannins. GOLD: Joseph Phelps Insignia Napa Valley 2005, 94 Points, $200- Bursting with blackberry fruit, chocolate and subtle cedar. Mouth-coating blackberry and blackcherry notes above soft perfume and dark godiva chocolate elements. Lightly cedary with a distinctive wet stone and gravel undertone, long length. Round tannins, chocolate and mineral linger, smooth, deep and elegant throughout. SILVER: St. Clement Orropas Napa Valley 2005, 91 Points, $60- Lightly earthy aromas above black fruit, clovey spice and cocoa powder. Powdery, beautiful body with deep black cherry, blackberry, black tea and chocolate. Clove spice pulls together the finish, long length with cocoa powder nuances. Very light oak, earthier than usual, light notes of cola creep in. BRONZE: Chateau St. Jean Cinq Cepages Sonoma Valley 2005, 90 Points, $90- Dusty black fruit complexities with cherry and chocolate nuances. Full-bodied and bursting with black cherry fruit on the palate, rich chocolate notes linger behind. Smooth, creamy finish with sweet oak perfectly intertwined, round tannins add subtle dryness. GOLD: Pride Syrah Sonoma County 2006, 92 Points, $65- Subtle blackberry, licorice, dark red currants and light leathery character on the nose. Complex palate with red currant fruits, perfumey floral notes, orange peel, violet and dark berries. Soft, plush mouthfeel, with hints of pepper spice and exotic cooking spice running rampant. Long finish, delicious fruit flavors, pepper and hints of leather linger. SILVER: Truchard Syrah Napa Valley Carneros 2004, 91 Points, $30- Classic profile, with lots of leather and licorice on the nose. Delicious body of velvety black licorice, black cherry, blackberry above smoke, leather and pepper spice through the long finish. Perfect by-the-fire wine, perfect representation of the grape. BRONZE: Arrowood Syrah Sonoma Valley 2002, 90 Points, $40- Leathery aromas of black fruit, pepper and chocolate. Velvety and deep, with black licorice and blackberry above leather, black pepper and sweet spices. Long finish, with hints of smoke and earth understated. GOLD: Mauritson Grower’s Reserve Zinfanel Sonoma Valley 2005, 89 Points, $35- Spicy red apple, cranberry and cherry notes on the nose. Medium-bodied with impressive texture, as spicy red cherry, raspberry and cranberry weave together above soft tannins and a hint of vanilla bean through the medium length. SILVER: Girard Old Vine Zinfandel Napa Valley 2006, 89 Points, $25- Black cherry, raspberry and toast aromas. Fairly deep black cherry flavors, dark wild berry fruit and a blast of pepper spice through the long length. Expressive dark fruits and very spicy, this is my type of Zin. BRONZE: Truchard Zinfandel Napa Valley Carnernos 2005, 89 Points, $25- Cinnamon spice wrapped around cherry and raspberry fruit on the nose. Spicy body of red apple, cherry, raspberry, spiced cranapple, this one cries for food. Cinnamon apple flavors carry through the medium length, this is a mouthful of spicy red fruits with herbal hints creeping in. A good Thanksgiving dinner wine. GOLD: Selby Pinot Noir Love Vineyard Russian River Valley 2005, 90 Points, $40- Very floral nose, with rose petal and violet above subtle strawberry and hints of smoke. Complex body of blueberry, cherry, violet and lavender notes. Sweet spice and smoke add to the the extremely long finish, floral fruit notes linger. SILVER: Domaine Carneros Estate Pinot Noir Carneros 2006, 90 Points, $40- Subtle strawberry, watermelon and rose petal aromas. Light-bodied with soft minerality, beautiful floral notes above black cherry, watermelon and strawberry fruit. Soft yet spicy finish with white pepper tones, long length with a hint of chocolate. BRONZE: Robert Hunter Pinot Noir Sonoma Valley 2005, 88 Points, $45- Jammy strawberry, raspberry and watermelon jolly rancher on the nose, hints of tobacco spice and cedar. Ripe and fruit forward, with well-structured watermelon, dark raspberry, strawberry and the slightest hint of blueberry. Firm presence of tobacco spice throughout, lightly floral and peppery, nice finesse. GOLD: Pride Merlot Napa-Sonoma Counties 2006, 91 Points, $50- Baked plum, dates, perfume and vanilla bean on the nose. Soft mouthfeel of creamy black cherry, plum, fig and dates above a strong vanilla character throughout. Hints of caramel and cedar linger through the long finish, subtle clove spice lingers as well. Smooth, creamy and complex, soft, round tannins. SILVER: Arrowood Cote de Lune Rouge Sonoma Valley 2005, 89 Points, $30- Very gamey and smokey, lightly floral with red currant fruit underneath. Red cherry and raspberry quickly evolve into strong smokiness with complex cinnamon spice, leather and floral layers with hints of vanilla lingering. Complex and innovative, long finish, round tannins add moderate dryness. BRONZE: Selby Dolcetto Russian River Valley 2007, 89 Points, $35- Lifted aromas of red fruit, hung game and leather, almost like barolo. Gamey body of red fruit and smokey bacon above clovey spice. Light-bodied and elegant, love the texture on this, long finish. GOLD: Gloria Ferrer Royal Cuvee Brut Carneros 2001, 91 Points, $35- Light citrus aromas of pear, melon and lime with hints of almond. Crisp but creamy body with complex layers of lemon, lime and grapefruit which evolve into almond, hazelnut and vanilla. This has sugary components throughout and a hint of mineral through the long finish, notes of ginger and cinnamon linger, complex. SILVER: Domaine Carneros Le Reve Carneros 2002, 91 Points, $85- Intense nose of lemon, apple and yeast. A mouth-gripper, with lemon, almond and pear notes above exotic spice, very creamy and delicious through the long finish. GOLD: Truchard Chardonnay Napa Valley Carneros 2006, 90 Points, $25- Crisp, clean pear and green apple notes above soft oak. A mouthful of spicy citrus fruit, pear, apple, melon, peach and lemon with well-balanced vanilla bean and oak lingering through the impressive finish. Creamy with crisp, balanced acidity, with fruit showing through the oak elements. SILVER: Rombauer Chardonnay Napa Valley 2007, 89 Points, $40- Golden body with green apple citrus and deep, butterscotchy oak. Thick and creamy body of green apple, peach and kiwi fruit, nicely balanced oak tones. Long, slightly spicy finish, fruit shines here, creamy texture, lively acidity. BRONZE: Robert Hunter Chardonnay Sonoma Valley 2006, 89 Points, $40- Creamy, golden body with lots of oak and butterscotch on the nose alongside tropical notes of mango and peach. Very creamy and smooth, with golden delicious apple, peach and pear fruit above soft vanilla, toffee and butterscotch nuances. Lively acidity through the long length. Great balance with complex fruit and oak elements. GOLD: Joseph Phelps Sauvignon Blanc Napa Valley St. Helena 2006, 88 Points, $30- Clean and fruity citrus aromas above hints of mineral. Soft pear, lemon and grapefruit citrus flavors, all fruit here, notes of honey and creamy oak linger behind. Lightly spicy, light minerality through the medium length. Very little grassiness here, crisp and refreshing. SILVER: Groth Sauvignon Blanc Napa Valley 2007, 88 Points, $20- Bursting tropical citrus flavors of peach, guava, mango, honey dew and grapefruit, a touch of hay but fruit shines. Crisp, acidic body with melon flavors leading into peach, guava, mango and a bit of grapefruit develops into a creamy texture with soft vanilla bean that cuts the tartness nicely. This is balanced and delicious, smooth and creamy. BRONZE: Larkmead Sauvignon Blanc Napa Valley 2007, 87 Points, $20- Crisp, grassy nose with lime and grapefruit citrus notes. Acidity pumping through the honey dew, lime and grapefruit notes, hints of grass, finishes with notes of minerality. A touch of tartness lingers, but very crisp and fruity overall. Comments: Comments Off on Napa and Sonoma Tasting Recap…Again. – Texas Tech beats Oklahoma, Florida beats Alabama, then Missouri beats Texas Tech in the Big 12 Championship. Obviously Florida is in. However, who do they play? The right answer should probably be USC, but they trail Texas by a wide margin in the BCS Standings, and if the Horns can win out, they’d probably be tough for the Trojans to catch. It’s one thing to try to justify having a team in the BCS Championship that didn’t win its conference. It’s a completely different thing to try to justify a team who didn’t even play for its Conference Championship! But of course, this misses the biggest problem, which is just deciding which Big 12 South deserves to play for the Championship in the event that Texas Tech loses this weekend at Oklahoma and Oklahoma takes care of business against Oklahoma State the following weekend. I looked into the tiebreaker scenario, and this situation would take us down to the sixth tiebreaker, which is…. (Wait for it)…..the team ranked highest in the BCS Standings! And the kicker here is that a team might actually benefit from not playing in the Championship game by way of a Missouri victory, and then catapult itself over its “Big 12 North Representative” all the way to the Championship game. This shouldn’t happen. However the Big 12 North Champion is selected, (and I can’t even begin to devise a method to figure that out if Texas, Texas Tech and Oklahoma all have 1 loss and are 1-1 against each other) only that team should have a chance to make the BCS Championship Game. If they lose, then USC has to get the nod. What a debacle! Hopefully Texas Tech will win the rest of their games and save the BCS once again, but I think we’ve all watched too much college football to think there’s a good chance of the gods taking it that easy on the BCS. USC certainly deserves a chance to get back into the argument. They’ve played as well as anyone in the past few weeks (except maybe Florida) and their road loss at Oregon State is looking better and better every day. However, the long and short of it is that if the Red Raiders lose, there are going to be two unnamed teams from the Big 12 South (probably Texas Tech and Oklahoma) left out of the national championship picture without much justification, and I never hope for that. Florida’s offense is absolutely blazing right now. They are probably the scariest offensive team I’ve seen in a decade the way they’ve been playing the last few weeks. With such an improved defense, they have to be the pick to win the Championship right now, even over USC. I can’t believe how easily Texas Tech handled a very talented Oklahoma State team two weeks ago. It will be interesting to see if they can maintain that intensity this weekend. The ACC is a complete joke right now and no team in that conference deserves to be in a BCS game. Maryland, North Carolina, Boston College, Georgia Tech, Florida State and Miami are all 7-3 and all have basically an equal number of wins over each other. Yawn. None of them are very good either. The Coaches Poll is doing some silly things. They have Oklahoma ranked ahead of Texas and Missouri ranked ahead of Oklahoma State. Someone fix this please. Those teams have the same records and have played each other. You won’t see mistakes like this on my list! Michigan at #10 Ohio State, 11:00 AM CST, ABC: The parity in college football is amazing. Only two short years ago, these two played one of the decade’s best games as undefeated team fighting for a spot in the National Championship. This one doesn’t figure to be as close, but it’s still the best rivalry in the game. #17 Michigan State at #9 Penn State, 2:30 CST, ABC: If Michigan manages to pull a monumental upset, then this one is for a spot in the Rose Bowl if your name is Sparty. Otherwise, Penn State need only take care of business in Happy Valley in front of their home crowd. Gotta root for JoePa to get back to Pasadena. #16 BYU at #7 Utah, 5:00 CST, MTN: This is the last road block for the Utes, who are poised to secure a BCS bid if they can win this one at home. It won’t be easy. #19 Pittsburgh at #20 Cincinnati, 6:15 CST, ESPN 2: The winner of this one suddenly in the driver’s set for the BCS bid out of the Big East, and the Bearcats can allt but secure it with a victory. Pittsburgh still has West Virginia to face in a couple of weeks. This should be an unexpectedly good game. #1 Texas Tech at #6 Oklahoma, 7:00 CST, ABC: Another in a series of fantastic Big 12 night games this season, and it will be as meaningful as the rest. It’s likely that the loser is out of the BCS Championship picture. I’ll certainly be pulling for Tech, but I have to admit, this is a really tough spot for them, going into Norman to face a hungry Sooner squad that probably should have never lost that Texas game to begin with. I recently returned from my second journey of the year to the Napa and Sonoma valleys, and tasted over 100 wines over a four day trip (more on that in due time). With the holiday season drawing near, I thought it would be appropriate to highlight one of the fantastic sparkling wines being produced in this region. 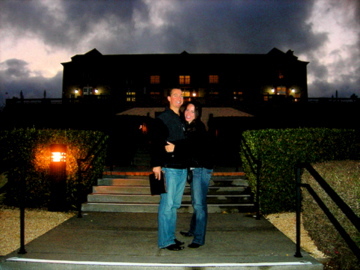 Check out the photo at the very end of the post, which shows us soaking up the spooky twilight ambiance of Domaine Carneros in autumn! 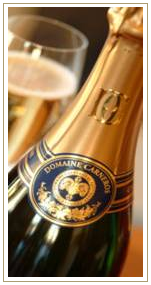 DOMAINE CARNEROS BRUT CARNEROS 2005, 90 POINTS, $25, 45,000 cases produced- Subtle aromas of pear, apple and hazelnut. Clean, crisp body of pear, lemon-lime, almond and hazelnut flavors which evolve nicely and with aggression. A serious sparkling wine that doesn’t try too hard, brassy minerality lingers with crisp fruit through the long finish. 66% Pinot Noir, 33% Chardonnay. College Basketball Preview…a bit late. Okay, so the season has started already, but nothing relevant has happened yet. I give you my brief preview of this year’s College Basketball season, and it goes a little something like this: It’s going to be tough for anyone to beat North Carolina, but the Big East appears to be the Big Beast this season, and the experience those teams gain from playing one another this season will give them the experience they need to be a big factor in March as well. 1. North Carolina- Part of me feels like they don’t even need to play the season because the Tarheels will be such massive favorites. While this squad on paper still isn’t as talented as the 2005 National Championship team, they will certainly be difficult to defeat. Considering they were most analyst’s pick to win the title last season, and they return all five starters, led by returning Player of the Year Tyler Hansborough (22.6 ppg, 10.2 rpg), it’s no doubt they’ll be the top choice again this season. He’ll get support from a deadly backcourt of Wayne Ellington (16.6 ppg) and Ty Lawson (12.2 ppg), while Danny Green and MArcus Ginyard provide depth along with a slew of top notch recruits. 2. Connecticut- After a disappointing finish to the season that culminated with a first round loss, the Huskies will be stacked and hungry this season. Senior guard A.J. Price (14.5 ppg) will be at full strength, while the massive 7-3 Hasheem Thabeet (10.7 ppg, 7.7 rpg) improved rapidly last season and seems poised to be a huge presence. Versatile swingman Jeff Adrien anchors the squad (14.8 ppg, 9.1 rpg) while junior guard Jerome Dyson adds more depth and experience. Freshman Kemba Wallace is expected to make an impact as well. 3. Pittsburgh- I really like the group that Jamie Dixon’s Panthers return this season, starting with underrated senior point guard Levance Fields (11.9 ppg, 5.3 apg). Senior forward Sam Young provides a big scoring threat (18.1 ppg), while power forward DeJuan Blair returns after an electrifying freshman season (11.6 ppg, 9.1 rpg). This team has size, depth and experience, and will be better than most people think, and I’m usually down on them. 4. UCLA- Aside from the fact that the Bruins have made three consecutive final fours, there are many reasons to like them again this season. Point guard Darren Collison ( returns for his senior season and is the best in the land, (14.5 ppg, 3.8 apg). Josh Shipp returns from last year’s starting squad, but expect the real punch to come from the nation’s best class of freshmen, led by guards Jrue Holiday and Malcolm Lee. 5. Texas- Point guard D.J. Augustin will be sorely missed, but don’t forget that this was easily one of last year’s best teams with plenty of talent around him. A.J. Abrams (16.5 ppg) should pick up the slack as the primary scoring threat, while swingman Damion James (13.2 ppg, 10.2 rpg) adds muscle. Senior center Connor Atchley should add force to the middle. 6. Louisville- Most experts are a lot higher on this team than I am, primarily because I think that losing David Padgett will be difficult to overcome. Still, this is an athletic team with a strong and deep backcourt led by Jerry Smith, Andre McGee and Edgar Sosa. The force up front will come from power forward Earl Clark (11.1 ppg, 8.1 rpg) and Terrence Williams (11.1 ppg, 7.2 rpg). Remember those dunks against Tennessee in that Regional Semifinal blowout? Read: Athleticism. 7. Purdue: As much as it pains me, it looks like the Boilers are poised for a huge season, and they’re my pick to win the Big Ten. No team in the conference demonstrated better teamwork last season than this underrated team, and they return four starters. Robbie Hummel is a scrapper inside, and E’Twawn Moore is one of the toughest three point threats in the nation. Keaton Grant and Chris Kramer add depth in the backcourt. 8. Michigan State: The Spartans got hot late last season, and the primary catalysts return in point guard Kalin Lucas (10.3 ppg, 3.8 apg) and athletic forward Raymar Morgan (14 ppg, 6.1 rpg). Big men like Goran Suton (9 ppg, 8 rpg) and Marquise Gray will add strength, but it remains to be seen how consistent this team will be. 9. Duke: There is more experience here now, but Duke is still searching for a go-to scorer. That man could be junior Jon Scheyer (11.7 ppg), a deep threat who can also drive and is automatic from the charity stripe. Senior Greg Paulus returns at the point, while returning scoring leader Kyle Singler (13.3 ppg) provides the primary inside presence, but at 6-8 leaves something to be desired. Still, the depth added from players like Gerald Henderson and Nolan Smith could make the Blue Devils a sleeper team. 10. Notre Dame: The Irish aren’t as deep as many of the nation’s top teams, but with monstrous 6-8 junior power forward Luke Harangody (20.4 ppg, 10.6 rpg) in the mix, they are automatically a force. He will get a lot of help from deep perimeter threat Kyle McAlarney (15.1 ppg, 44% 3 Pt) to create one of the nation’s most dangerous 1-2 punches and an experienced starting five. 11. Oklahoma: Sooner fans are excited about preseason All-American power forward Blake Griffin’s potential (14.7 ppg, 9.1 rpg), who returns for his sophomore season. Tony Crocker (11.3 ppg) returns in the backcourt, but all eyes will be on freshman guard Willie Warren, one of the nation’s top newcomers. 12. Davidson: After watching this team’s amazing run to the Elite Eight, where they nearly knocked off eventual champion Kansas, I gained a new respect for mid-majors. As opposed to George Mason, this was a team that was virtually invincible all season, didn’t just get hot in the tourney, and wasn’t intimidated by anyone. The main threat returns, as the now-household name that is junior Stephon Curry (25.9 ppg) is back, and should average more than that. Make no mistake, they belonged in the top eight teams of last season, and should be close again this time. 13. Memphis: The heartbreaking collapse in the title game won’t be soon forgotten, but Memphis still has a strong team and needs to move on. Willie Kemp and Antonio Anderson return in the backcourt, and power forward Robert Dozier adds strength and experience. Freshmen guard Tyreke Edwards is expected to become an immediate member of the scoring machine. 14. Gonzaga: The Zags return with another deep squad anchored by dynamic point guard Jeremy Pargo (12.1 ppg, 6.0 apg). There is depth here as well. 16. Marquette: One of the nation’s toughest backcourts will move on without Tom Crean (at least my Hoosiers got somebody good out of this mess) behind point guard Dominic James (12.9 ppg, 4.4 apg) and shooting guard Jerel McNeal (15.0 ppg). Expect Marquette to go four guards as usual, so there are some questions as to how they’ll adjust with this system to a new coaching staff. 17. Kansas: Sure, the defending champs lost a lot of talent, but they will still enter the season with the swagger that comes with being the champs, and behind returning starters like point guard Sherron Collins and center Cole Aldrich, that could go a longer way than a lot of people think. 18. USC: A disappointing second round loss last season cost me all of my NCAA Bracket Pools and forced me into an early Saturday morning trip to St. Louis earlier this fall, but that is beside the point. The Trojans will have the talent to make a run once again, as junior forward Taj Gibson (10.8 ppg, 7.8 rpg) and guard Daniel Hackett both return, and highly touted freshman Demar DeRozan fills in for the departed O.J. Mayo. The question is whether they can get their act together on the big stage this time. 19. Miami, Fl: Could this be the best team the Canes have ever had? Shooting guard Jack McClinton (17.7 ppg) returns to see if they are. 20. Arizona State: Sophomore guard James Harden (17.8 ppg) returns will All-America credentials, and there is depth around him to try to make amends for last year’s controversial tourney snub. Comments: Comments Off on College Basketball Preview…a bit late. I’m sure there were lots of great games earlier in the day Saturday, and I watched them all, but somehow I forgot about all of them after seeing that amazing showdown in Lubbock. In what was easily the best game of the year up to this point, Texas Tech kept its amazing run alive as they battled back to beat Texas 39-33 in a game that they really controlled from start to finish. When Texas drove down the field and took the lead 33-32 late in the fourth quarter, it was hard to figure out how the Horns were in position to steal this one away after being outplayed from the onset. Texas Tech suffered late in the game from its lack of a strong field goal kicker, which forced them to play for touchdowns rather than field goals when the latter would have been more than enough to seal the victory. But, this time, Texas scored too fast, and gave the Red Raiders another chance with about a minute and a half to play, more than enough time for such a deadly offense. QB Graham Harrell nearly threw an interception that would have ended the game, but was fortunate to have Longhorn Blake Gideon drop the pass. Harrell made the best of his second chance, and connected with Crabtree on a risky timing pattern with 8 seconds left for the TD that was again a function of the uncertainty in the kicking game. Crabtree pounded this reality home as instead of diving out of bounds and setting up a chipshot field goal, he pivoted into the endzone for the game winner. Had he been tackled, the game would have been over. True drama. Now, Texas Tech has to maintain the same intensity they demonstrated Saturday night in winning the biggest game of the program’s history, as Oklahoma State comes to town. The Raiders would be wise not to overlook these guys, who proved two weeks ago that they are right on the same level as Texas. 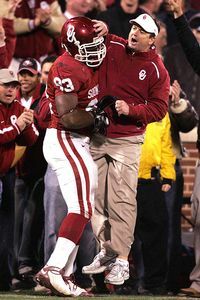 After that, a trip into Norman to face Oklahoma is a tough spot, but not impossible. And of course, if they can get through all of that, they’ll be rewarded by facing a tough Missouri team (that everyone seems to have forgotten about) in the Big 12 Championship Game. A tough rough to be sure. More interesting is the likely scenario that Texas, Oklahoma and Texas Tech all end up with one conference loss and are all 1-1 against one another. The tiebreaker in this case? The team with the highest BCS ranking gets the nod. Whatever that means. Anyone that has an idea how you can separate these three teams in that scenario, please explain. We’ll deal with that when the time comes though. Meanwhile, Florida is playing as well as anyone right now, and devastated hapless Georgia 49-10 in a Cocktail Party Game that certainly never lived up to its potential. It’s starting to make we wonder how on earth Florida lost to Ole Miss at home. I mean how is that even possible? However, I am getting tired of hearing pundits justify a one-loss Oklahoma, Texas, Texas Tech or Oklahoma State team getting into the championship game ahead of a one-loss Florida team on the basis that Ole Miss is a “bad loss”. The Rebels have lost four games, to Wake Forest, Vanderbilt, South Carolina and Alabama by an average margin of just under 5 points. Read: Ole Miss is a good football team, and finishing the season 8-4 is not impossible. In fact, 7-5 looks worst case right now, with a road trip to LSU the lone obstacle. It should be interesting to see how the argument shakes out between a one-loss SEC Champ and a one-loss Big 12 Champ, because I don’t foresee either jumping ahead of a Penn State team that looks likely to be undefeated. Of course, Alabama and Texas Tech still control their own destinies. #13 TCU at #9 Utah, 7:00 CST, Thursday- The Mountain West is certainly having its best year ever, and it would be tough to imagine one of its three top-15 teams not finding their way into a BCS game. Utah is no stranger to undefeated seasons, but they’ll face their toughest foe of the year here in the Horned Frogs, whose only loss against Oklahoma shouldn’t keep them out of the BCS if they can win a big one on the road here. #24 Georgia Tech at North Carolina, 11:00 AM CST Saturday- Don’t look now, but the winner of this game controls their own destiny in the Coastal division and should become the favorite for a BCS berth over the Atlantic division representative, who at this point is anyone’s guess (could be Maryland, Florida State, Wake Forest or even Clemson). #1 Alabama at #16 LSU, 2:30 CST, CBS- This will be a big test for the Crimson Tide, although they’ve played better away from home this season. Going into Death Valley is never an easy task, but I think the Tide offense should be alright here against an LSU defense that is clearly a shadow of its former self. With a win here, Alabama will look towards Auburn and then the SEC Championship game against a hungry Gator squad. #8 Oklahoma State at #3 Texas Tech, 7:00 CST, ABC- I for one don’t think that Texas Tech is going to be taking this game very lightly, but for some reason I think that the Oklahoma State offense could give them a bit more trouble than the Texas offense did, and that wouldn’t be a good thing. The Cowboys have such versatility with QB Zac Robinson, RB Kendall Hunter and WR Dez Bryant, all three of whom rank in the top four in the nation for yardage at their respective positions. It should be another high scoring classic that could go either way. I can’t remember a year with such great Big 12 games. #19 California at #5 USC, 7:00 CST, ABC: USC doesn’t lose at home often, and they’d be wise to gain some style points here against the only other ranked team in the conference. If Cal can pull off a shocker, guess who else controls their destiny in the Pac-10? The mighty Oregon State Beavers, who get Cal at home in a week and are a loss to Stanford away from being 6-2 with losses at Penn State and Oregon. More amazingly, if Oregon State wins out, they technically should win the tiebreaker over USC and be the Pac-10 representative in the BCS, leaving USC dependant on an at-large berth that they aren’t likely to receive over a one-loss Big 12 team that gets left out of its conference championship. That would be hilarious.